The antibody VI-RE/1 reacts with human vimentin, a 57 kDa intermediate filament protein expressed on a wide variety of mesenchymal and mesodermal cell types. Conjugated with R-Phycoerythrin (PE) under optimum conditions. Purified antibodies – protein A (G) affinity chromatography before conjugation. Conjugated antibodies –site exclusion chromatography. Our Abpromise guarantee covers the use of ab49918 in the following tested applications. Working concentrations should be determined by the investigator. ab49918 staining Vimentinn in HeLa cells. The cells were fixed with 4% formaldehyde (10 min), permeabilized in 0.1% Triton X-100 for 5 minutes and then blocked in 1% BSA/10% normal goat serum/0.3M glycine in 0.1% PBS-Tween for 1h. The cells were then incubated with ab49918 at a working concentration of 10μg/ml (shown in red) and ab185031, Rabbit monoclonal [EP1332Y] to alpha Tubulin (Alexa Fluor® 488, shown in green) at 1/250 overnight at +4°C. Nuclear DNA was labelled in blue with DAPI. Flow Cytometry - Anti-Vimentin antibody [VI-RE/1] (Phycoerythrin) (ab49918)Image from Cervelló I et al., PLoS One. 2011;6(6):e21221. Epub 2011 Jun 21. Fig 5.; doi:10.1371/journal.pone.0021221; June 21, 2011, PLoS ONE 6(6): e21221. 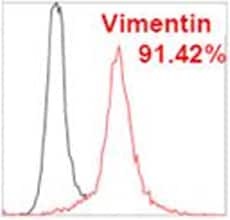 Flow cytometric analysis of Human stromal endometrial somatic stem cells, staining Vimentin with ab49918. Publishing research using ab49918? Please let us know so that we can cite the reference in this datasheet. There are currently no Customer reviews or Questions for ab49918.